Morten Morland‘s cartoon from The Times, November 4th. The New York Times ran an editorial yesterday on what it called ‘a coup’ against the Supreme Court. The death of Antonin Scalia earlier this year, and the Republican Party’s refusal to entertain a replacement has rendered the previously nine, now eight judge court unable to resolve some important cases, split evenly as they are between four generally liberal and four generally conservative justices. The GOP Presidential Nominee, Donald Trump, has recklessly attacked other institutions in his scorched earth strategy that followed his poor showing at the debates, including the Military, the FBI, the President, the Federal Reserve, and the Media. Early on in the campaign, he attacked a judge who ruled against him, claiming the judge was biased because he was Mexican-American. He has threatened to jail his opponent if he wins, he has consistently attacked and undermined the electoral process itself, and encouraged voter suppression. Every pillar of democracy in America has been weakened by Mr Trump’s candidacy whether he wins or not, and people love him for it. Meanwhile, in the UK, a disingenuous campaign of misinformation and xenophobia replaced previous anti-Europe campaigns that had been based on political idealism, and ideological nationalism. Appealing to British exceptionalism alone had failed in the past. Sure, it was necessary to quote Shakespeare and misquote Churchill, but it was also necessary to demonise the ‘other’, even when that ‘other’ was increasingly defining modern Britishness. Expertise was banished to the sidelines in favour of hyperbole and exaggeration. 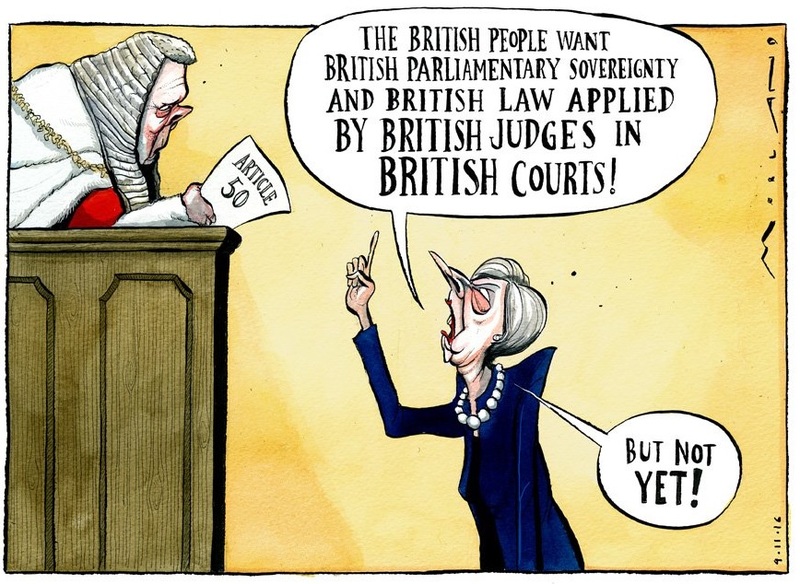 When the London High Court recently upheld a claim that Theresa May required the backing of parliament in order to trigger Article 50, a constitutional check that only a few months ago would have seemed blindingly obvious, the Daily Mail branded the three judges ‘Enemies of the People’, echoing the Terror that marred the French Revolution. These are shaky times for Anglo-American democracy; but not just in America and Britain. The rise of the far right across Europe, the popular strongmen in Russia, the Philippines and Venezuela, and a general reactionary spirit haunts modern democratic governance. Our historic institutions of judiciary, executive and legislature are denuded in favour of allegations of permanent government control, special interest influence, and a weary inevitability surrounding political succession – they’re all the same. Jeremy Corbyn and Bernie Sanders never had a prayer. Many point to historical precedent – the rise of fascism in Europe in the 1930s is a popular go-to point of comparison – though surprisingly few have looked to income and wealth inequality as a source of social anxiety, and what Sam Huntingdon and Francis Fukuyama have called political decay. “[T]here is substantial evidence from public administration specialists that the overall quality of the American government has been deteriorating steadily for more than a generation,” Fukuyama says (Political Order, p.460). Trump decries the elites, increasingly detached from ordinary citizens by rampant inequality, and it resonates. Elites do tend to protect their interests, and as Fukuyama puts it, ‘they were always more interested in the rule of law than in democracy’ (p.403). Trump challenges the rule of law, as do Brexiteers. Westminster knows that while Europe was first, they will be next. The establishment is challenged by a discontented citizenry who have shed their respect for previously venerable institutions, which have simply not delivered for them. The financial crisis, brought on by a system of increasingly perverse incentives and basic flaws in the capitalist orthodoxy, has inevitably now become a political crisis. Western liberalism, and the rational-legal logic of democratic government is facing a genuine philosophical crisis.